Browse food, toys, treats and much more! Go to myvetstore.ca/omvs or click the order online button. Have your pets food delivered directly to your home. Choose the auto order option and receive a discount that covers your shipping costs! If you live in Hawkestone or the surrounding area in ON, then you have picked the perfect site to find your veterinarian. Karla Scott is a graduate of the Ontario Veterinary College and licensed through the College of Veterinarians of Ontario. At Oro Medonte Veterinary Services we treat all types of companion animals. Your pet's health and well being is very important. The doctors and support staff will take every step available to give your pet the best possible care. Oro Medonte Veterinary Services is a full service animal hospital and will take both emergency cases as well as less urgent medical, surgical, and dental issues. Beyond first rate pet care, we take pride in our clinic being comfortable, kid-friendly, and a calm, relaxing environment so you and your pet can relax in the waiting room and look forward to meeting his or her own veterinarian. We have a number of resources for you to learn how to take better care of your pets. Browse around and look at our articles and pet videos. The best veterinary care for animals is ongoing nutrition and problem prevention. If you want to ask a question call 705-487-7387 or email us and we'll promptly get back to you. Our veterinary hospital is very easy to get to, and you can find directions on our Contact Us page. You can also subscribe to our newsletter which is created especially for pet owners. In between your veterinary visits, your pet will benefit from you reading these free informative articles. At Oro Medonte Veterinary Services, we treat your pets like the valued family members they are. Dr Karla is a graduate of the Ontario Veterinary College. 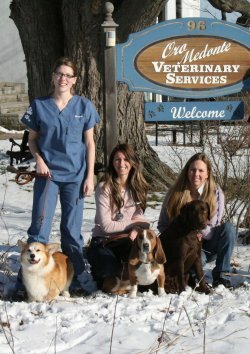 Since 1998 she has been providing veterinary services to pets in the Barrie and Orillia area. Growing up on a farm in Grey County, Dr Karla knew at a young age that animals would be a huge part of her life. Experience gained through competitive horse back riding over the years lead Dr Karla to pursue post graduate training in Animal Chiropractics and Canine Rehabilitation Therapy. In 2009 Dr Karla completed her training through the only accredited Canadian Animal Chiropractic Colleg, the CanadianVeterinary Learning Center resulting in a diploma in Animal Chiropractics (CAC), and in 2012 she earned her diploma as a Certified Canine Rehabilitation Therapist (CCRT). "Thank You to Dr Scott and all the staff today. You took your time and were so patient with our new Puppy Piper! You answered all our questions and had such great suggestions to make puppy life easier. What a wonderful local Vet to have literally in our back yard. See you again in a month!"